May 15, 1986. 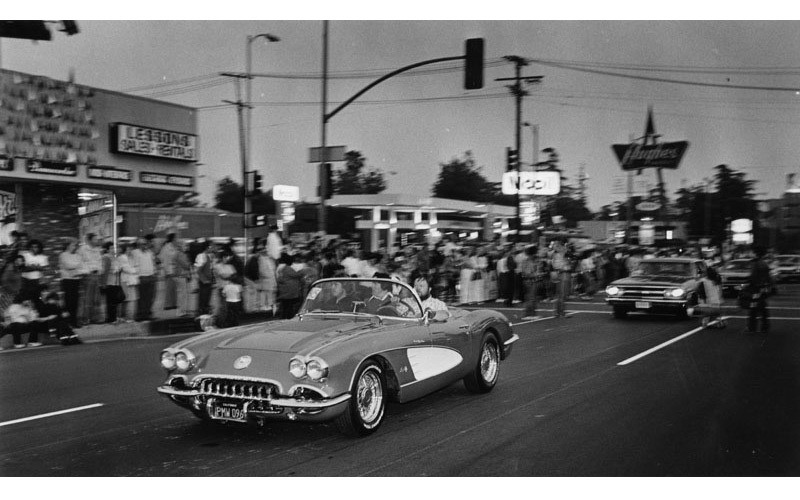 A classic cruising-era Corvette motors along Van Nuys Boulevard. Back in the day, there was a lot more wheat. Really, a lot. In the 1870s, had you walked the southern length of what is now Van Nuys Boulevard, you’d have been separating wheat from chaff. Isaac Newton Van Nuys and his future father-in-law, Isaac Lankershim, cultivated nearly 60,000 acres of the grain at the time. They’d pack their harvest into cars from the Southern Pacific Railroad, which had expanded into the San Fernando Valley in 1876, and ship it overseas. The family sold its stake in 1909 to a real estate syndicate led by L.A. Times publisher Harrison Gray Otis, which subdivided the land. Suburbia was on its way. Two years later the southeast part of the Valley took the name Van Nuys, after Isaac. One of the town’s founders, developer H.J. Whitley (the “Father of Hollywood”), lived in a mansion on the mile-long main drag, which was known back then as South Sherman Way (after yet another developer). Paved in 1911, the street was renamed Van Nuys Boulevard in 1926, and over the next three decades it grew to ten miles. Previous articleThis is the Only Place You Can Get New Zealand Cuisine if You Live in L.A.